Most years I hope for a wet spring. 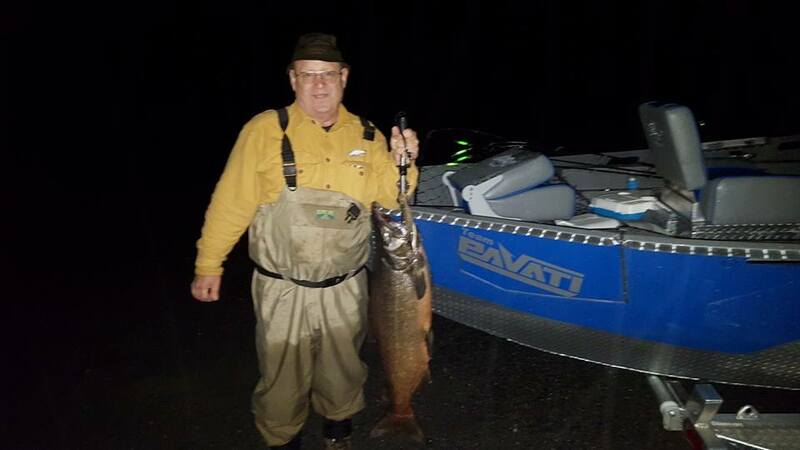 A wet spring normally extends the good fishing by a few weeks or more. However, this is getting ridiculous. The lake is flooding and people are losing lots of money. Businesses that habe been waiting all winter to start making money are under water. Even worse are the memories lost when a family camp or home is washed into the lake or flooded beyond repair. My heart goes out to these people. 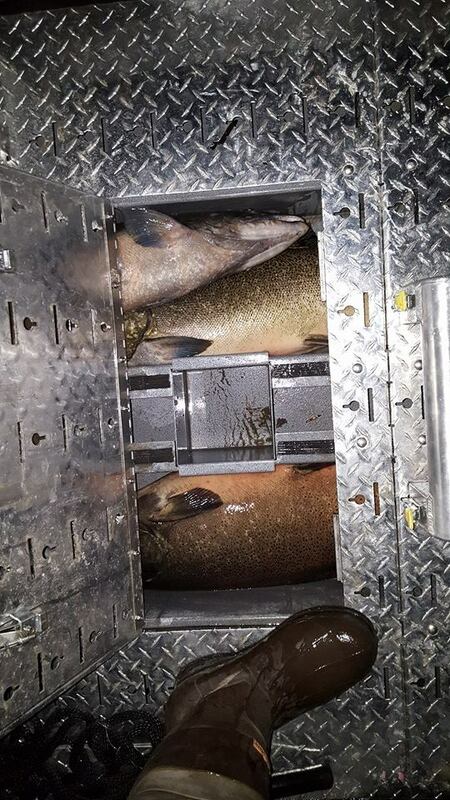 Trout were stocked in many places just before it started. This means those fish were able to spread out in the streams before the poachers got them. We will have good flows and cool water through June and maybe into July for the Tug Hill trout streams. Trout fishing on Tug Hill is going to be good this year. 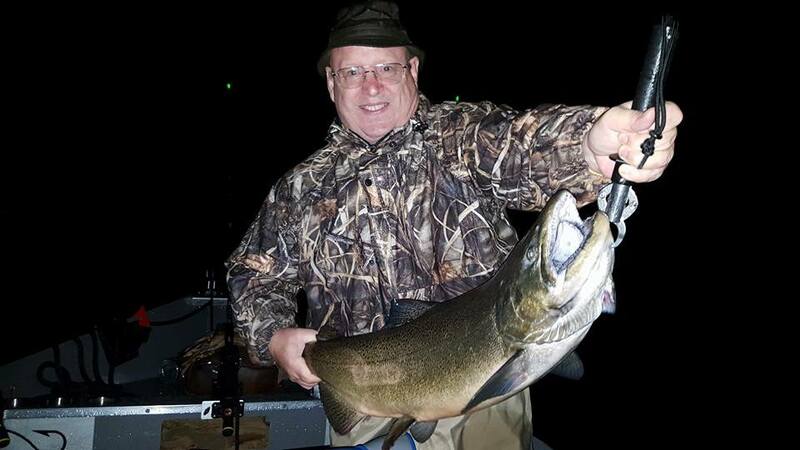 Steelhead fishing on the Salmon River will extend well into mid May. Back country bass ponds should remain full of water and fish we’ll through the entire summer this year. Now let’s all just hope the rain stops soon. While you are sitting at home hoping make sure your gear is ready. When the water receeds it’s going to be on in a big way. First off I would like to say good luck to all of those headed out for opening day tomorrow. As I write this I am sure on some streams there are people already lined up waiting for midnight to start casting. Opening day is a holiday for many. For those that have to work they will most likely spend the day doing their job while secretly planning their attack for Saturday. I am sure there are some that will even call in sick if they haven’t already. I am going back to work tomorrow after being out for 3 weeks due to having my gallbladder removed. I know going back to work on opening day is crazy but I have guide trips Saturday, Sunday, and Monday so I needed to be back to work before I can be guiding. Also there is the fact that my home water, the Salmon River, is open for trout fishing all year. We have been chasing giant rainbow trout, steelhead, all winter long and will continue to do so through April. In fact the bite just started to really get good while I have been out of work and unable to fish so I am really looking forward to this weekend. I do still have a couple dates open but my April is close to being fully booked. In between working and guiding for steelhead this month I will be organizing my fly vest and tying more flies. Just waiting for May when I will hang up the steelhead gear and start chasing brookies, rainbows, and browns. I have already been following the line blue lines on my topo map and searching for new places to try. There is a beaver pond I have been meaning to hike to for two years now and this is going to be the year I finally do it. I have never been a still water fly fisherman but that is going to change this year. I am also planning a trip to my favorite trout stream the West Branch of the Ausable river. I introduced my friend Jamie to it last year and he had a blast even though we were only able to fish one evening. This year we are planning a 4 day trip filled with trout and craft beer which happen to be two of my favorite things. I am looking forward to seeing the Facebook and Instagram posts tomorrow as the mild winter has left most streams in prime condition for the opener. Even the Tug Hill streams that normally have snow lined banks are in great shape as all the snow has already melted and run off. Again good luck to everyone that is fishing tomorrow or this weekend. Phil has fished with me the past 2 years. The first year was a great trip. We had 2 kings in the boat by 6:30 in the morning and put the 3rd in the boat about 10:30. Last year was not so great. Actually it was horrible. It rained the entire time we were on the river. To make it worse we never landed a fish. 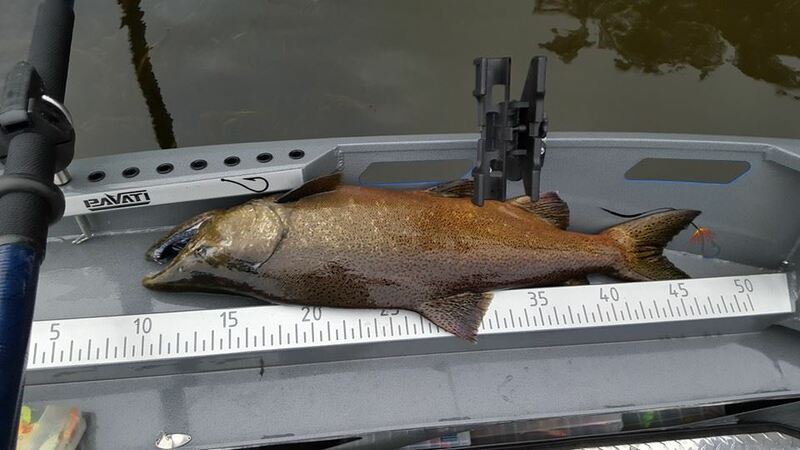 We only hooked one fish that turned out to be a very large brown trout that got off just inches from the net. This year Phil and I debated where to fish when he came up. After looking at our options I told him I felt fishing the evening into the night in the river mouth would be our best bet. Turned out I was right. We started fishing about 4:30 pm and the boat was back on the trailer with a limit of King Salmon in the fish box by 8:30. Phil was obviously a very happy customer. Phil’s fish weighed in at 24,19,and 17 pounds. All very nice Salmon. 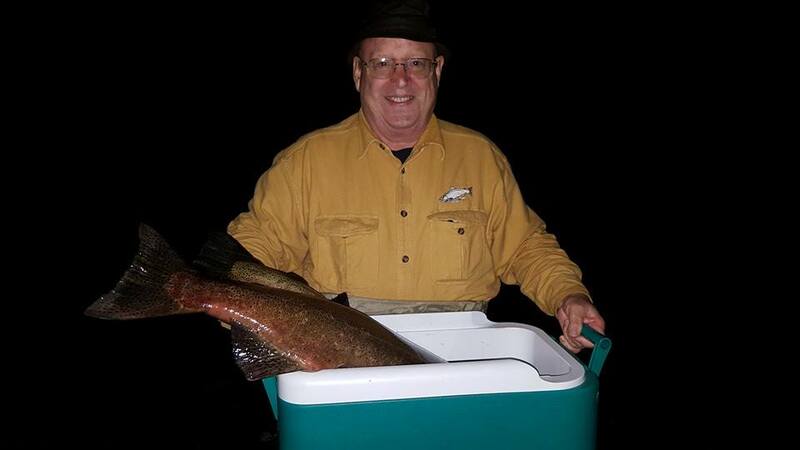 The only problem he had was that he brought a cooler for Maryland fish to NY. As we say here we measure our fish in pounds not inches. Phil should’ve brought a bigger cooler. Team Pavati. I love this boat and so did Phil. 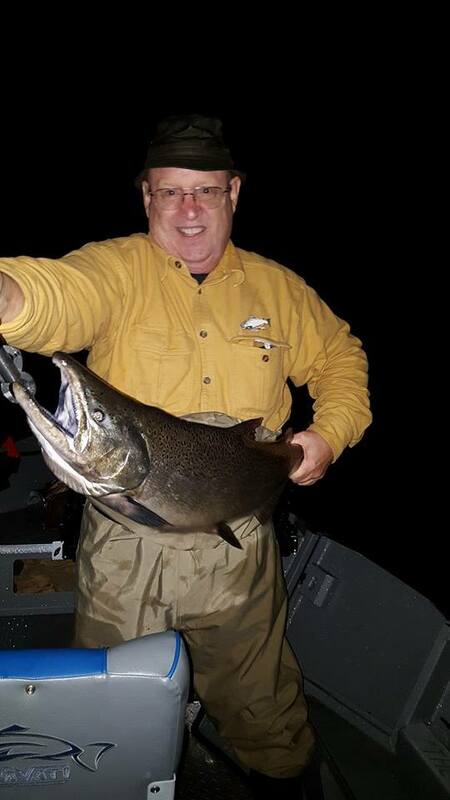 24 pounds of King Salmon. Gotta love “the truth” scale. Pavati has it all.